Borja comes from Madrid, but started his training in violin making in the U.S. He moved to Cremona to study at the violin making school. After graduation, he worked with Silvio Levaggi and Alberto Giordano before establishing his own workshop. In 2006, Borja won two silver medals for a violin and viola at the Violin Society of America competition in Baltimore. Ferrari graduated from the Cremona violin making school ten years ago and has worked with Massimo Negroni and Elio Severgnini. He works both in Cermona and Madrid. We picked this violin from our last Cremona exhibition. Nolli, like many of the top Cremona makers, was fortunate to have been at the school when Stefano Conia and Giorgio Scolari were teaching there. Since graduation, he has won numerous medals at competitions all over Italy and has launched a very successful career. This violin is now a few years old and has been “played in”. The tone is smooth, clear and responsive. Virgoletti is the son of a woodworker and lute maker and was introduced to violin making by Ferdinando Garimberti. After making several violins, he began a ten-year apprenticeship with Sesto Rocchi. Starting in 1993 he began working with the Bisollottis (both father and son). After serving his apprenticeship in Mirecourt with his uncle Victor Rambaux, Delivet went to Paris to work with H.C.Silvestre. He opened his own shop in Paris in 1892. In 1918 he left Paris for Canada. It seems that his best work, such as this violin, was that done in Paris. He won numerous awards and medals during those years. Fernando Solar is considered one of the most important Spanish makers of the 20th century. His instruments are known for their full, rich tone. This violin is a fine and characteristic example of his work. Although little is known about this obviously talented maker, this violin exhibits a great deal of skill with a French influence. There are interesting handwritten inscriptions inside referring to an important event in Irish history. Otto Paulus was one of the finest luthiers of the long established Paulus family of Markneukirchen. He studied with his brother, Albin Ludwig Paulus Jr. before setting up on his own in 1904, passing his master’s examination in 1914. This collector’s quality violin is pictured in “Vogtländscher Geigenbau” by Zoebisch, the most important book on violin making in the Markneukirchen area. The tone is brilliant, nuanced, and responsive. A talented young maker, Fanfani studied with Angelo Sperzaga at the International School of Violin making in Cremona. After graduating in 2003, he worked in the shop of Sperzaga. In 2011 he opened up his own shop in Piacenza. This violin was made while working with his master, and has a clear, even, ringing tone. Born in Livorno in 1964, Pietrantonio worked with several important makers who trained him in the traditions of the Bisiach family and especially Igino Sderci. 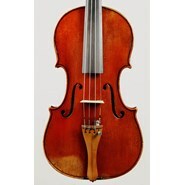 This violin is a reproduction of the model of J.B.Guadagnini and has as wonderful rich tone of great character. Born in 1905, Merighi was a self taught maker, constructing violins based on the models of the Cremonese school. This violin was made when he was nearly 70 years old, and is characteristic of his rustic charm. Labeled Gaspar da Salo. 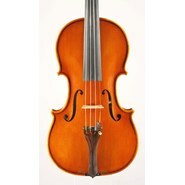 A great violin for the musician looking for an instrument with a full, dark, rich tone. Over the last 25 years the brothers Rezvani have made more than 500 violins, violas, and cellos. They began their studies in Iran with Ibrahim Ghambari Mehr, ex-student of the Parisian master, Etienne Vatelot, and later in Vienna with Johann Rombach. They continue perfecting their art as members of the Violin Society of America, working with such masters as Joseph Curtain. Now based in Los Angeles, they produce excellent instruments. Their work is very characteristic, resonant and sweet, easy to play, rich in tone color. We are very fortunate to have several of their instruments at this time, perfect for a young musician. Trabucchi graduated from the Cremona International School of Violin making in 1988, at the young age of 18. At the school he studied with Massimo Negroni and Stefano Conia, before apprenticing with Marco Nolli for four years. Since 1992 he has had his own shop in the historic center of Cremona. He has won numerous prizes for the high level of his work. This violin is a fine example of his art. It is light in the hand, easy to play and produces a brilliant, colorful tone. Emil Hermann was one of the most important violin dealers in Berlin, later opening a shop in New York in 1924. Among his clients was Jascha Heifetz, who purchased his famous Guarneri Del Gesú in 1922. Among his employees were great luthiers like Simone Sacconi and Mario Frosali. Hermann acquired fine violins from the best luthiers in Germany to sell in his shop. This particular instrument was made for and sold by Hermann, and is in new condition, looking as if it was recently made. It has an exceptional tone, full and powerful. Son of a violin repairman, Jean Bauer trained with Marius Didier in Mattaincourt before settling in Le Havre, Normandy, in 1936. With the turbulence of the Nazi occupation, Bauer moved to Angers, where he spent the rest of his celebrated career. He was highly decorated for his instruments at competitions in Paris in 1929, 1931 and 1937, Toulouse, in 1931 Angers, in 1942, and The Hague, in 1949. This violin is made on his own model, at the height of his abilities, with characteristically stellar workmanship and beautiful red-orange varnish. The instrument is in superb condition. The tone is vibrant and rich, at once nuanced and powerful. The G.A.Pfretzschner workshop in Markneukirchen is best known for their fine bows, but also produced exceptional string instruments as well. This beautiful violin has a truly fine tone. 1999. After studying at the violin making school in Mittenwald in his native Germany, Kapfhammer moved to Salt Lake City and taught at the violin making school there in the mid 70’s. He has worked primarily in Salt Lake, but also for a number of years in the Bay Area. The tone of this violin is powerful, responsive and brilliant.